Peter Egan is far and away my favorite automotive journalist and although I don't get to read his work nearly enough, I always enjoy it when I do. In one of his Side Glances columns for Road Track magazine, Egan talked about rules for roatripping, which all sounded very good at the time I originally read them. However, over the years, I seemed to have forgotten all but one rule. Egan suggested that one should never eat at a restaurant on the road, that is also available at home. This would include most of the big franchises and while I generally adhere to this rule, I have been known to break it for both Culver's cheese curds and Sonic breakfast burritos. I can also be spotted at McDonald's, who has recently earned back at least some of my business from places like Culver's, because they offer free Wifi (I'm typing this from inside the Power Pack Nation Excursion, which is currently parked outside the KOA office in Muskegon). 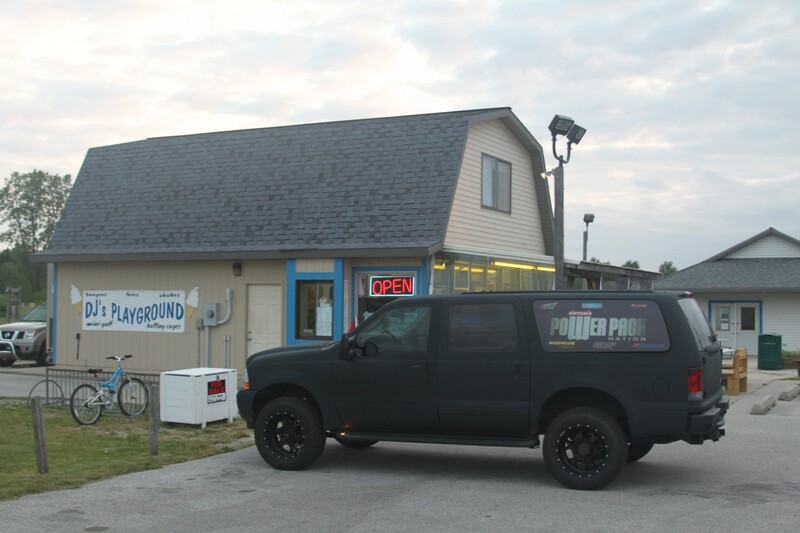 In Muskegon, Michigan, we chose DJ's Playground, because it was close to our campground and we didn't care about Wifi tonight, because we could get it at the KOA. On the drive down from Wisconsin, we chose Skyline Chili in Louisville, because I'm addicted to it and because I wanted to become the first person to ever appear twice on the Coney Dog wall of fame (all Wall of Fame members must eat at least 10 dogs in a single visit. Other members include a German Shepard). We're headed to Detroit tomorrow, for the final day of the 2010 Hot Rod Magazine Power Tour. I don't know where we'll end up for dinner, but I hope to connect with a few of my friends in the Detroit area, especially if rain wipes out the final day of Power Tour like everyone thinks it will. Even if it does, we've still taken hundreds of pictures of the cars, trucks, lawn tractors and snowmobiles on this year's Power Tour and we've posted them all in our Facebook photo albums. If you'd like to see all things amazing in the automotive world, check it out. Sponsors- You want 'em, but how do you get 'em?